Wahama pitcher Hannah Billups throws to Emma Gibbs at first base during the Lady Falcons’ 8-4 win on Tuesday in Hartford, W.Va.
HARTFORD, W.Va. — The Lady Falcons trailed, but not for very long. 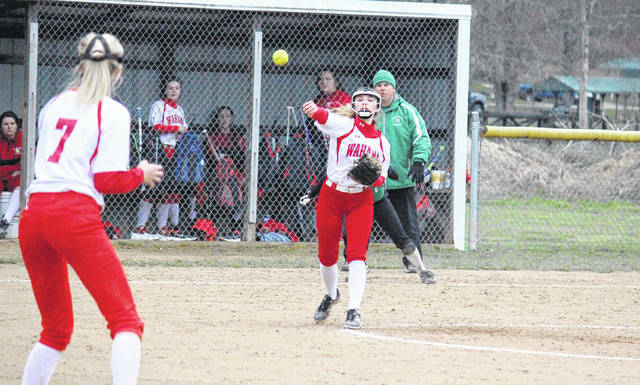 The Wahama softball team overcame a three-run first-inning deficit by scoring eight consecutive times before eventually claiming an 8-4 victory over visiting Waterford on Tuesday night in a Tri-Valley Conference Hocking Division contest in Mason County. 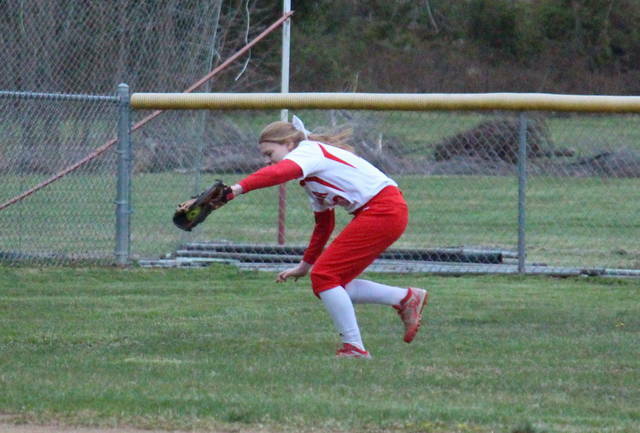 The host Lady Falcons (7-2, 4-0 TVC Hocking) found themselves in an early three-run hole as the Lady Wildcats produced a leadoff single, three walks and also had a batter hit. A one-out bases-loaded walk to Offenburger allowed Taylor to score, then Neater scored on a wild pitch to make 2-0. Smith grounded out while also bringing Young plateward, giving the Green and White a three-run cushion one-half of an inning into play. Wahama, however, countered with three runs in its half of the first, thanks in large part to four hits, a walk and a fielder’s choice. Hannah Rose led things off with a double and scored one batter later on an Emma Gibbs single, then Hannah Billups delivered a two-out single that allowed Grace Haddox to score for a 3-2 deficit. An error on the Billups hit also allowed Ashtyn Russell to score while tying the game at three. The Red and White claimed a permanent lead in the second as a Gibbs groundout brought in Victoria VanMatre for a 4-3 edge, then Emily VanMatre delivered a two-out single that plated Rose for a 5-3 advantage. Haddox scored in the fourth after Emily VanMatre was hit by a pitch with the bases loaded, then Maddy VanMatre singled home Rose for a 7-3 lead. Gibbs also scored in the inning on a sacrifice fly by Billups, giving Wahama its largest lead of 8-3 after four complete. Tornes grounded out in the top of the seventh while allowing Taylor to score, completing the 8-4 outcome. The Lady Falcons outhit Waterford by a sizable 10-3 overall margin and also benefited from two Lady Cat errors, the only miscues in the contest. The hosts stranded seven runners on base, while Waterford left five on the bags. Billups was the winning pitcher of record after allowing three earned runs, three hits and four walks over seven innings while striking out four. Smith suffered the setback for the guests after surrendering seven earned runs, nine hits and three walks over four frames while fanning three. Rose led the Lady Falcons with three hits and three runs scored, followed by Emily and Victoria VanMatre with two safeties apiece. Billups, Gibbs and Maddy VanMatre also had a hit each for the victors. Taylor, Offenburger and Hoffman had the lone hits for the Lady Cats. The contest with Waterford was the first of two games played by Wahama on Tuesday night.